I have Kleenex stuffed into the pockets of every coat I own, my makeup bag holds eyedrops and Claritin, and I keep an ample supply of Benadryl at my desk. Given those details, you may have been able to correctly guess that I suffer from allergies. What am I allergic to? It’s hard to say, since every time I’ve gone for an allergy test I react to literally everything they test me for. Nothing like getting 185 needless needle shots to the arm, am I right? While this straightforward app focuses on showing allergen levels in your area, it also lets you sync with Ford Sync—a nice bonus if you’re driving a Ford that supports that feature. It’s also a handy way to identify days that may trigger your allergies, if you check it frequently enough. It doesn’t provide additional information on the weather, however, and it doesn’t offer any way to catalog or track symptoms. 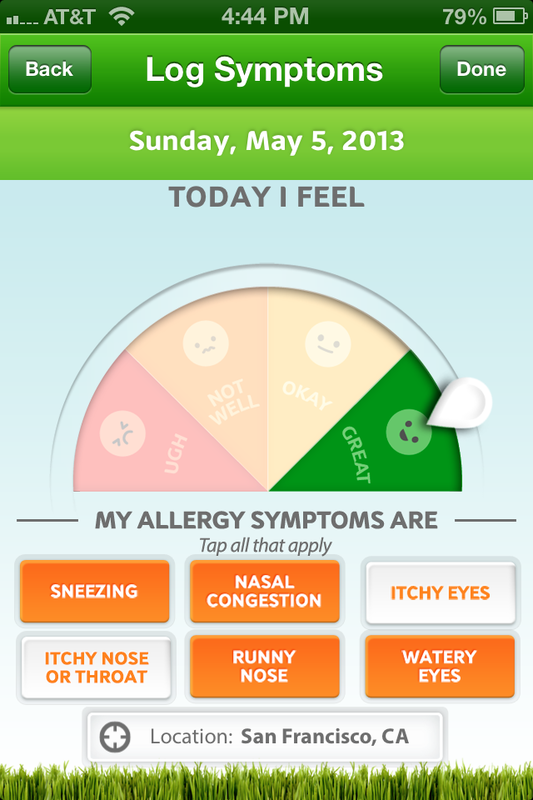 Another company-branded app, Zyrtec’s AllergyCast overcame my initial skepticism to become my favorite app of this bunch. 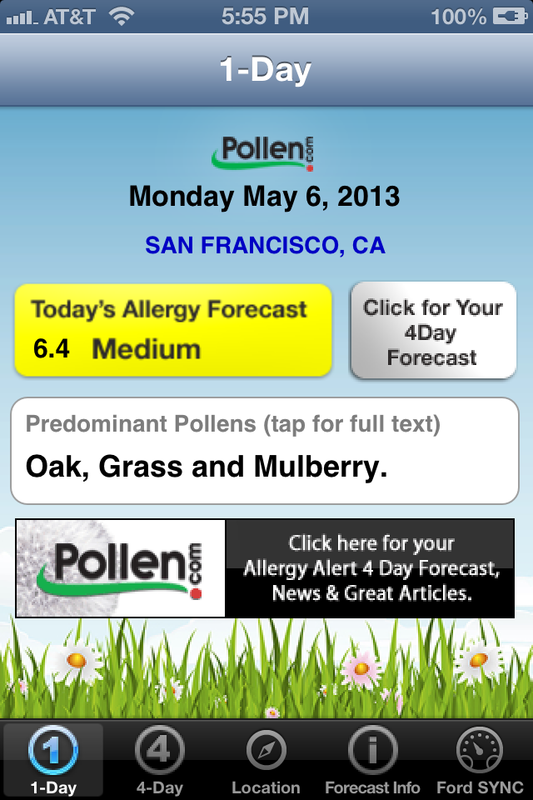 In addition to offering an allergy forecast, the app provides a weather forecast, identifies the predominant pollens in the area, shares tips for controlling both indoor and outdoor allergies, and has a tracking feature that you can use to chart your symptoms. It also has an array of cute cartoon animals spread throughout the apps features, because who doesn’t like a cat in glasses reading a book? 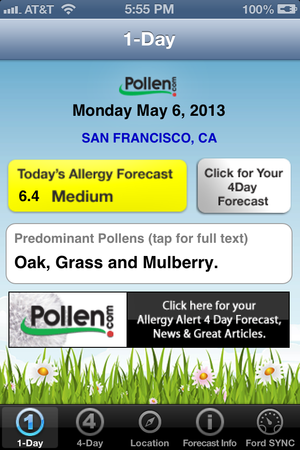 The home page of the app displays your location, the date, and an allergy forecast (for example, today is a 6.3 or medium allergy day), as well as a box listing the predominant pollens (grass, chenopods, and cedar/juniper are today’s choices), a weather forecast, and a button to log your symptoms. The symptoms tracker is one of the app’s best features: When you tap ‘Log your symptoms’, the app takes you to a screen where you can select how you’re feeling with a colored smiley face, and tick off a number of symptoms. The app saves the date, weather, and pollen information (including the day’s allergen ranking) alongside your symptoms so you can chart how you’re being affected by your allergies. Another well-thought-out aspect of the app is the tips section which offers links to four categories: ‘Allergy or Cold’, ‘Indoor Allergies’, ‘Outdoor Allergies’, and ‘Allergies and Kids’. Each tips guide presents a few screens worth of tips and tricks—such as brushing pets outside—for minimizing your allergy symptoms. Admittedly, Zyrtec includes ads and coupons in the app, but at least it neatly tucks them away under the Products tab. You’ll have to create a profile before you can get anything good out of WebMD’s Allergy app—but when you do, it offers a nice array of allergy alerts, tips, articles, and videos dedicated to keeping your symptoms in check. 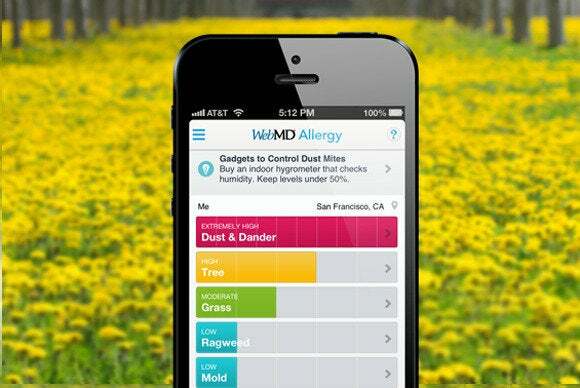 During signup, the app asks you to indicate the allergies that affect you. Then it provides you with a personalized forecast based on the criteria you’ve selected. The app’s homepage displays a weather forecast, a link to a related article (such as cleaning tips to prevent dust mites), and a bar graph that displays the allergens that might be affecting you that day. Tapping an item in the bar graph takes you to a page that explains what the ratings mean, lets you control notifications and alerts for that allergen, and provides a link to tips for that particular allergen. For example, the Tree Pollen Allergy item links to an article that describes what a tree pollen allergy is, what makes it worse, and how you can help bring it under control. You can share these articles via email, Facebook, or Twitter, and the app has a menu that points to an Allergies 101 section full of information (and a few pop-up ads). Tapping the Menu button also allows you to access a weather forecast and an allergy-tracking feature that you can use to select symptoms and treatments and include notes. It’s a nice app overall—fairly comprehensive and cleanly designed, though well populated with banner and pop-up ads. 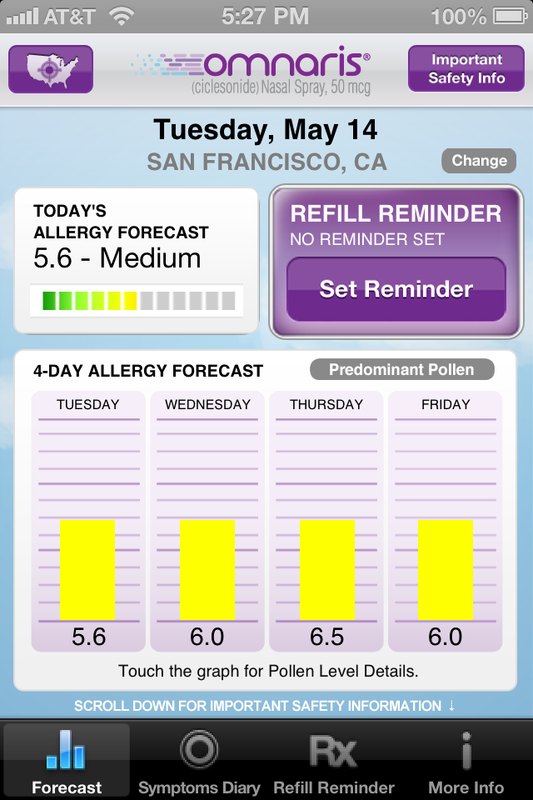 Much like Pollen.com, AllergyManager provides a color-coded allergy forecast, in addition to a symptoms diary, a medication reminder, and allergy tips—but it’s pretty heavily branded. Under a banner ad for Omnaris, the home page displays the date and location, as well as daily and four-day forecasts. The daily and four-day forecasts use a color/number system (today was rated at 6.3, or yellow/medium level, while the weekend is expected to be at yellow and orange levels ranging from 6.3 to 7.6). A handy box lets you remind yourself of when you need your allergy prescription refilled, though the absence of alert pings or messages tied to this feature means that it’s useful only if you’ll be looking at the app regularly (and don’t have a better way to remind yourself to refill). The bottom navigation of the app has options for access the Symptoms Diary, and another tab to accessing the Refill Reminder (with a very unsubtle ad for Omnaris). The symptom tracker here is similar to the ones found on WebMD Allergy and AllergyCast but with a plainer design and fewer options—it gives you only four symptoms to select from. It does provide an emailable Symptoms Report or chart. The More Info section contains a few tips on Fall Cleaning, Pet Allergies, and similar subjects, but the heavy branding on this app got a little tiresome. 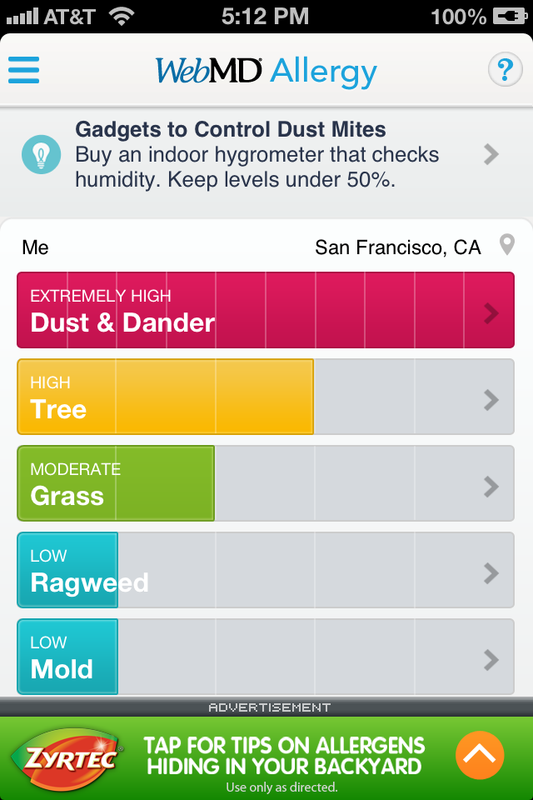 Admittedly this isn’t quite an allergy app, but if you suffer from seasonal allergies and are trying to identify foliage in your neighborhood that may be contributing to your symptoms, Tree ID is a pretty handy way to figure out which saplings are causing you to sneeze. 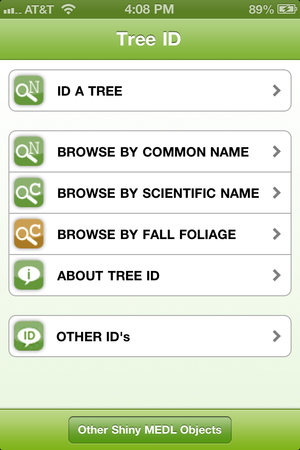 Organized in a straightforward, almost textbook fashion, the app allows you to browse for a tree by common name, by scientific name, or by fall foliage, or ID a tree. If you select ‘ID a Tree’, you’ll be presented with 30 characteristics to use to identify the tree such as Leaf Type or Bark Color. Each characteristic has a question mark on the right that will lead you to more information and a drop-down menu on the right you can select from. 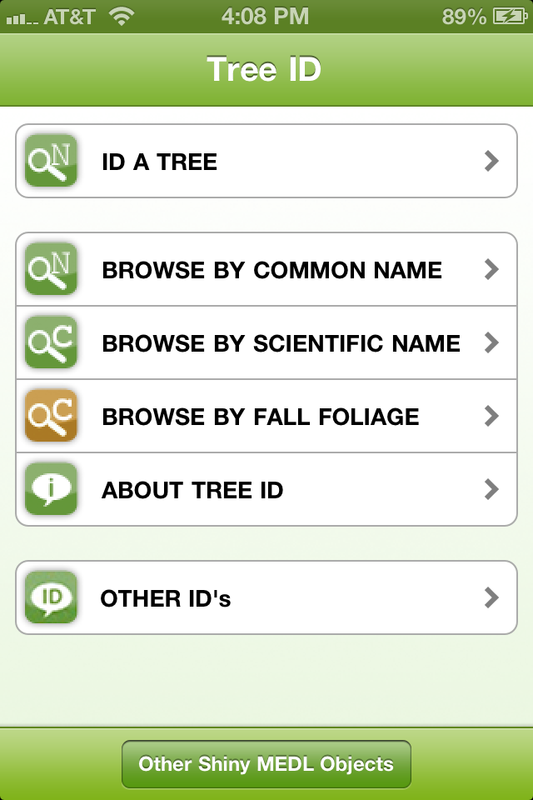 It’s designed strictly to help you identify trees, but it does so in a straightforward and comprehensive manner. If you’ve been recently diagnosed with allergies, this textbook-style app can provide you with a wealth of information on how to clean to help alleviate allergy symptoms, particular cleaning products (such as white vinegar) that may help reduce symptoms, and actions you can take (such as keeping coats and backpacks out of the bedroom so they won’t track in allergens) to diminish your allergies. It’s a good primer if you’re just starting to tackle your allergies, though it’s pretty much limited to a few screens of text.